Passed peacefully away on February 13, 2019 after a long period of failing health but, as she had wanted, in her own home and surrounded by her family, Frances M. (Fran) Dearin, nee Merner, in her 95th year. Her beloved husband, Charles, predeceased her in 1981, as did three of her children, Susan Marie (1955), Paul (1954 - 2007), and John (1957 - 2013), and her sister/brother-in-law and dear friends Don and Margaret Moores. Leaving behind to miss terribly their wonderful mother and dear friend are her daughters Fran (Paulette Sourisseau) of Darlings Island, NB, Sue, Marg (Brian Scott), of St. John’s, and Leah (Jim Rodger) of Torbay, her son Charles (Dianne) of Pasadena, her daughter-in-law Sandy Clarke-Dearin of Calgary, and the grandchildren who brought her such joy: Jonathan (Diana White & great-grandchild Sophie) and Sarah Martin; Colin (Laurence Fecteau), Katy (Brandon Green), and Ian (Becca Walker) Scott; Ewan, Andrew, and David Rodger; Bruce, Angela, and Tammy Dearin; Maree and Liam Dearin, along with her dear nephews Jim (Ann Marie) and Paul (Sharon) Moores. Her family would like to thank the professional women who brought such compassion and security to all of us in Mom’s final months: Suzanne Condon, NP, the Palliative Care Team, and Ashley Brocklehurst, her care worker. Cremation has taken place. The family will be receiving visitors at Carnell’s Funeral Home, 329 Freshwater Road from 2-9 p.m. on Sunday, February 17th. Funeral mass will be celebrated on Monday, February 18th, 2019 at 9:30 a.m. from Mary Queen of Peace Church, Torbay Rd. Interment to follow at Holy Sepulchre Cemetery. 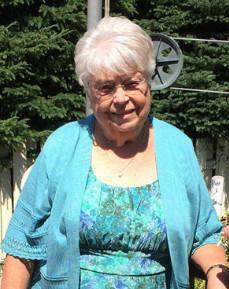 Flowers gratefully accepted or donations in her memory may be made to the Palliative Care Unit, L. A. Miller Centre. To send a message of condolence please visit www.carnells.com.